Once Louis XVI was deposed the Austrians realized that they needed to act in order to protect other monarchies of Europe from the same fate. Emperor Leopold II (Austria) would gather a coalition of states and send a threatening message about what would happen if the King wasn’t reinstated in the Declaration of Pilnitz (1791). The language of the declaration was vague on purpose because he really didn’t have much support for invasion from the other countries, so this was a bluff to a large extent. The leaders of the Assembly, who had no real experience in international negotiations, took this declaration seriously instead of seeing the document for what it was. They would choose a pre-emptive attack instead of waiting for the coalition to attack them. The problem was that France was a mess at this point, they still had major debt and the Assembly fought over every little detail. They knew they needed decisive leadership to win a war like this but they simply didn’t have it. monarchs in a similar fashion to what the French had done. Brussels, for instance, had broken away from Austria recently and created their own “United States of Belgium,” but had been reconquered by Austria before their independence could be solidified. This hope of inspiring a revolution would hinge on the ability to win early victories though, and the French were completely unprepared to do that. They had recently lost most of their talent in military leadership and those leaders who took over were always in fear for their lives. With this lack of leadership in every possible area, the French would start this war with massive defeats against the Austrians from the moment the French preemptively invaded the Netherlands. The losses against the Austrians and Prussians would mount as time progressed and the 2 groups would eventually invade Northern France, which caused a major panic among the people. The King would veto a decision to post 20,000 Guardsmen (called Fédérés) outside Paris, probably because he was hoping the countries would take over France. This decision would alienate himself from the royalists (Girondists) that had been his strongest supporters up to this point. He would dismiss his cabinet of Girondists, but would be very much alone after this decision. The Assembly would start to scare people about the possibility of invasion by foreigners at the same time. They would send out calls to the entire country to join the military, claiming they would lose without a great deal of troops. At the exact moment it looked like the Austrians were going to win this war, they issued another threat about the King, hoping to end this war now and go home. This threat united the people in ways the Austrians didn’t see coming, and a massive riot would start with the aims of taking the King out of power for good. 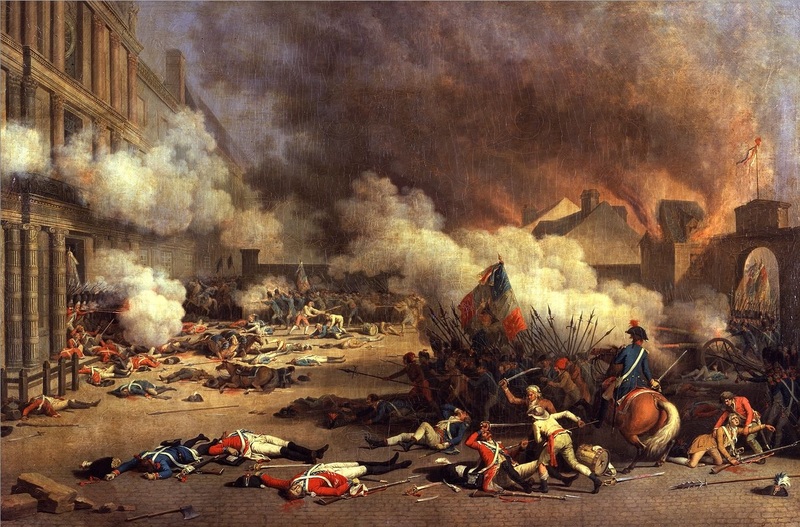 In what has become known as the Revolution of 10 August 1792 (very clever name), the Girondists would attack the Tuileries Palace with the Fédéré militias the King had vetoed the use of. The 950 men who guarded the palace would be so outnumbered that the hardly stood a chance, especially after their own General Mandat was killed. The King and Queen would run to the Assembly for protection, hoping that the Assembly would save their lives from the masses of people out to get them. The problem was that only 1/3rd of the deputies of the Assembly were present at the time, and all of them were the most liberal of the Jacobins. This portion of the Assembly would choose to suspend the King and start planning a republic, even though they didn’t have enough members present to make a decision like that. They would throw the King and Queen in prison and start the preparations for this new government immediately.